Fashion terms can be confusing and one of the most oft-mentioned terms in Ivy and Pearl Boutique product descriptions are dress styles and silhouettes. What’s the difference between a A-Line dress, chemise, and empire? The guide below will remove some of the mystery surrounding the many different types of dresses. This is a typical shift dress. 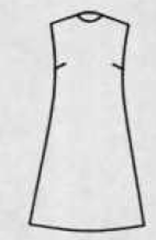 This is a typical A-line dress. An A-line dress is a dress with normal shoulders, slight flared toward the hemline, but without a waistline seam. They may also be called shift or skimmer dresses. A caftan dress is a long dress with a decorative opening at the neck and long sleeves. A chemise is a straight dress without a waistline seam cut with few or no darts. They are also called shift dresses, sack dresses, or pencil dresses. A float dress is a straight dress with no waistline seam and fullness controlled with pleats or gathers at the shoulders or yoke. A Princess dress is a dress without a waistline seam, fitted by curved seams originating at the shoulder or armhole, extending over the bust to the hem. The skirt may aor may not be flared. A sheath dress is a straight, narrow dress without a waistline seam that is fitted with darts. Essentially, a sweaterdress is a long tight-fitting sweater that falls well below the waistline. Sweaterdresses are a perfect way to stay fashionable when the temperatures drop. While primarily a casual dress, sweaterdresses do come in a variety of cuts and styles and can be a great wear-to-work option. A tent dress is a dress with normal shoulders, no waistline seam but very wide, full, and flaring hem. A trapeze dress is a dress with normal shoulders, no waistline seam, and more flare at the hemline than an A-line dress. A wedge dress is a dress without a waistline seam, with wide shoulders that tapers to a narrow hemline. Wedge dresses usually have dolman sleeves. 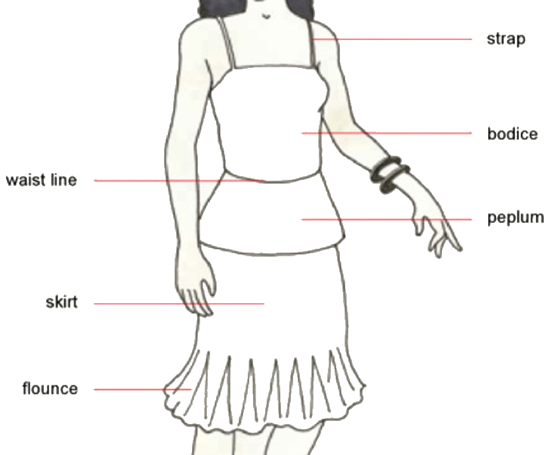 A basic dress is a simple, fitted dress, usually cut with jewel neckline, darts, fitted set-in sleeves, natural waistline, and a straight skirt. They are also referred to as fitted dresses. A drop waist dress is a dress with an elongated bodice so that the waistline seam falls below the waist. They are also called low-torso dresses. 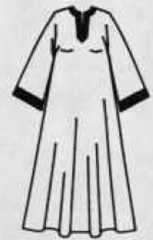 An unfitted variation of soft, drapable fabric with a short skirt may be called a flapper dress. An elasticized waist dress contains elastic in the waist for comfort. 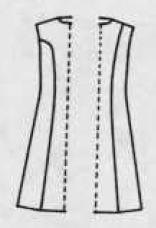 The dress may be of any style, either with or without a waistline seam. They may be belted or unbelted. An empire dress is a dress with a high waistline under the bust. A shirtwaist dress has a bodice styled like a tailored shirt, usually buttoned from neck to below the waist, with either a straight or full skirt. They may also be referred to as a shirt dress if it does not have a waistline. An asymmetric dress is a dress that is not the same on the left and right sides. 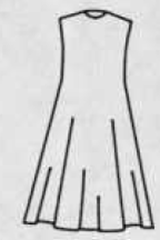 It may drape to one side or close to one side. It may cover only one shoulder. They are also referred to as one-shoulder or toga dresses. 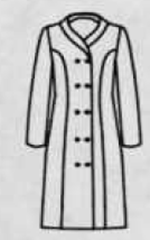 A coat dress is a dress which fastens (usually with buttons) from the neck to the hem like a coat. 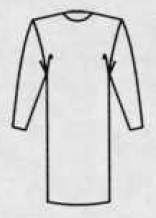 The coat dress may be single- or double-breasted and worn belted or unbelted. A draped dress is a dress with additional fullness pleated, gathered, or held to one side. A jumper dress is a sleeveless, collarless dress worn with a blouse or sweater underneath. A sundress is a dress with a camisole or halter type top worn for casual summer wear. A wrap dress is a dress that wraps and fastens to one side, either front or back. It may be held with button/buttonholes, ties, or a belt. Variations of the wrap dress include back-wrap, kimono, surplice, and bathrobe dresses. A pant dress is a combination bodice with divided or split skirt. Variations of the pant dress include culotte dress, pantgown, panel pant dress, and pantshift dress.